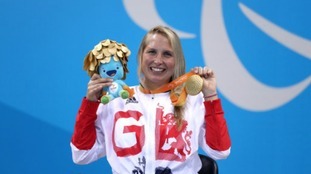 Wiltshire's Stephanie Millward ended her long wait for a Paralympic Gold last night, by winning the S8 100 metres backstroke. She's competing in her third games and narrowly missed out on setting a new world record. The 34 year-old from Corsham has been living with MS for 18 years. There was some success for Melissa Reid from Porthtowan in Cornwall in the PT5 Triathlon final this afternoon. She took bronze with support from her guide Nicole Waters, after USA's Elizabeth Baker took a fall. But they couldn't quite catch fellow Brit Alison Patrick who took silver.